Yamini Nayar, Chrysalis, 2013, C-print, 50 x 40". Eschewing any media-specific appellation for her practice, Brooklyn-based artist Yamini Nayar constructs intricate, abstract architectural still lifes, photographing the tabletop assemblages from various angles before ultimately discarding them. Questions as to whether the dozen or so photographs exhibited are the final phase of Nayar’s latest project or merely documentation of her process come off a ponderous circumlocution that detracts from the dynamic effect of the images themselves. 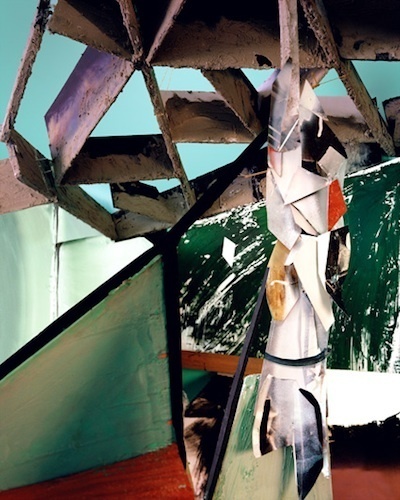 As with the large color photograph Chrysalis, 2013, Nayar deftly plays with the planar distortion and ambiguous perspective that results from the flattened dimensionality of photography. In the image—a frenzied architectural mise-en-scène constructed from found and raw materials—a honeycombed structure projects into a disparate field of angular, paint-streaked cutouts. Elsewhere, in Head over Heels, 2013, a bifurcated interior scene evades easy spatial apprehension. Bounded by sloping floors and angled walls, the work calls to mind a tripped-out version of Samuel van Hoogstraten’s seventeenth-century perspective boxes. The five smaller black-and-white unframed images that compose the series “On Form and Growth,” 2013, highlight a painstaking attention to detail that belies any sense of chaos found in Nayar’s other final compositions. Throughout, architectural forms, first sketched in felt-tip pen, transform into densely layered photocollages, which then become tableaux’s themselves—there is, no doubt, a method to her madness. Included in the exhibition, Akhet, 2013—a jagged accretion of streaked, subdued-hued scraps—makes titular reference to the ancient Egyptian concept for both horizon and the season of inundation when the Nile flooded. The threshold of vision for the pharaonic set was tied to periods of destruction and regeneration. Indeed, despite an aesthetic that favors ruin, Nayar looks to be less concerned with razing media-based boundaries than with expanding them.